Sport e-bikes fulfill the purpose they bear in their name - they are sporty. 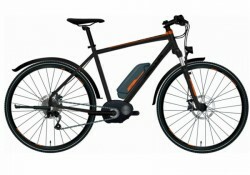 Sport e-bikes are, i.e., e-mountainbikes of a very stable frame and wide tyres for a very good grip in the open country. The electric motor offers a valuable support for strong ascents. Sportiness and pedal support are not a contradiction for sport e-bikes. As the bike motor turns off at 25 km/h, you are as sporty as in general for higher speeds.